They say Fender on them so you know they're cool. 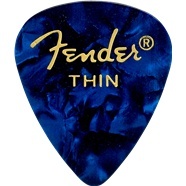 Fender Premium Celluloid picks combine the traditional tone and feel of celluloid, with beautiful and unique colors. They say Fender on them so you know they're cool. One dozen picks per pack.